Sea water contains more than 60 elements, some of them in microscopic amounts: for example, there is 1 g/m3 of gold in sea water. All the solids dissolved in sea water serve a purpose, and that is why the salts that are used to reconstitute water must be of excellent quality. 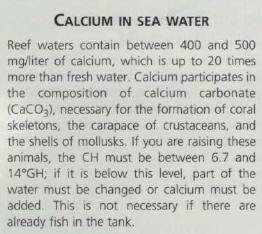 Some substances can accumulate in sea water and in high concentrations give rise to concern. This is especially true in the case of organic matter, but it is possible to eliminate them by partially changing the water or using certain devices, such as an aerator (page 250). As soon as the water is put in the tank, the ammonia content rises until, as shown in the graph, it reaches its maximum level after 8 to 10 days. Simultaneously, the bacteria wich transform this ammonia are developing and nitrites are formed, reaching their peak around the 15th day. Other forms of bacteria also develop, converting, in turn, these nitrites into nitrates. While the nitrites disappear between the 20th and 25th days, the nitrates must be eliminated by partial water change. The establishement of this cycle requires at least 3-4 weeks. During this period the ammonia and nitrites reach levels that are sometimes ten times that of toxic doses (identical to those of fresh water, see page 20).